PD: Who did you come to see? PD: Your Korean is good, are you really Chinese? Fan: Yes, I am. I learnt hard because of Park Yuchun. PD: How much do you love Park Yuchun? Fan: Look~ I came dressed just like him, right? It’s the same outfit as the one he wore in Shanghai Fanmeeting. Even the passion to match his clothes! 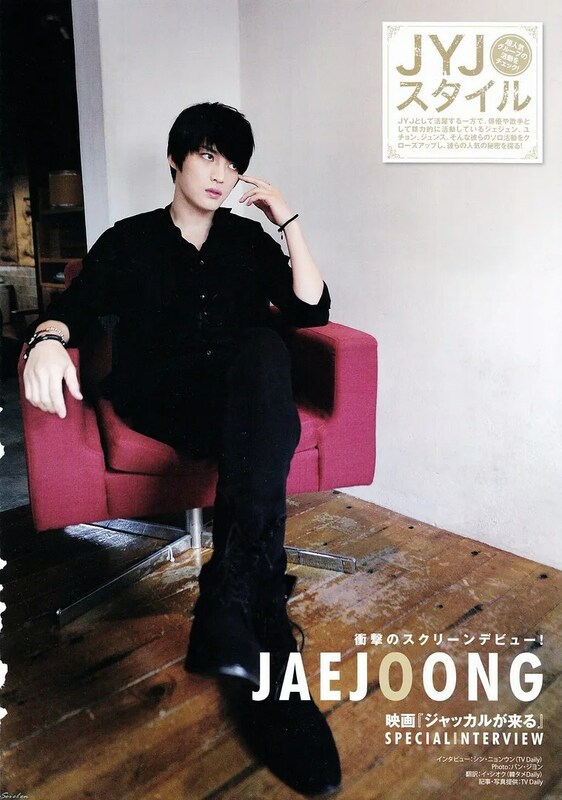 Fan: First, he’s very handsome, nice and is a good actor and singer. PD: What do you like so much about him? Fan: Everything (is attractive about him) ! Fans: Park Yuchun oppa, we love you! Yuchun oppa, we love you! Park Yuchun, we love you! Park Yuchun who gathers such fans differed with his entrance with screams by his international fans. He doesn’t forget his fans from the 2nd floor. 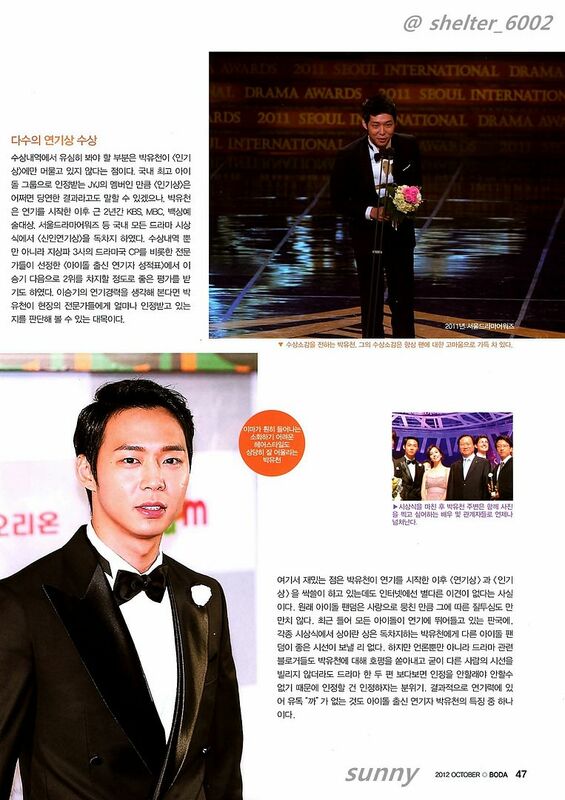 Then, was Seoul Drama Awards 2012 Park Yuchun Day? This day, Park Yuchun took the Popularity Award chosen by netizens from all over the world with a high difference of votes. 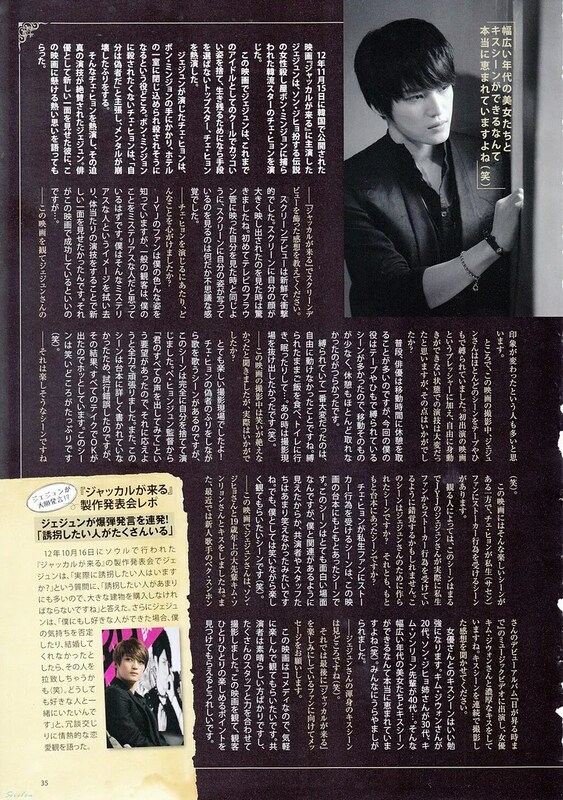 caption: Park Yuchun’s popularity secret? Yuchun: I think for 1. and 2. I still need to work harder in the future so I think it’s the third one. That’s not all. The drama Rooftop Prince has won 3 awards in total including Best Hallyu Drama and Best Hallyu Actor and he has showed his best hallyu star’s force. GakHa: I shall promise that we will stay together forever. Meanwhile, Park Yuchun is planning to genuinely have his Asia fanmeeting tour which started recently in Shanghai. Yuchun: I sincerely love you a lot, thank you. We will expect more handsome activities from you! The seventh Seoul Drama Awards was held on August 30 at 5:30 p.m. It was a global festival, in which many countries, including China, Taiwan, the Philippines, Columbia, Turkey, the UK, Germany, and the U.S., participated. Shin Hyun Jun, an actor who has a great sense of humor, and Han Go Eun, an actress who is good at speaking English, hosted the awards. It was also a day JYJ’s Yoo Chun proved his high popularity again. 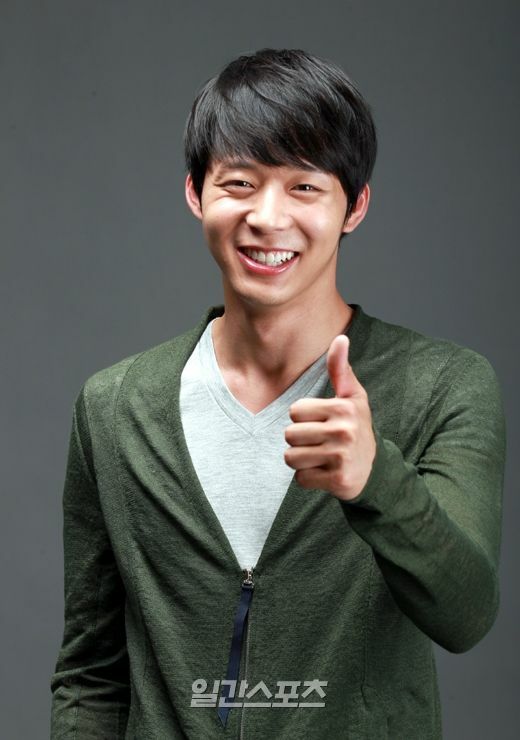 Yoo Chun won Best Actor (in Hallyu Special) for his acting in the drama series Rooftop Prince. Best Actress (in Hallyu Special) and Best Drama Series (in Hallyu Special) were also given to the lead actress in Rooftop Princeand the series. Yoo Chun also won Most Popular Actor. Best Drama Series (in serial/series) was given to the Korean drama series The Princess’ Man, and Best Soundtrack was given to the soundtrack of The King 2 Hearts, sung by SNSD’s Taeyeon. In addition, the British drama series Sherlock 2 and the German drama series Home Video, which stars Jonas Nay, won many awards. The Chinese actor Nicky Wu won Most Popular Actor along with Yoo Chun, and the Taiwanese actress Zhang Zia Yu won Most Popular Actress. The grand prize was given to Deep Rooted Tree, a historical drama series about the birth of Hangul. The 2012 Seoul Drama Awards is sponsored by Seoul Drama Awards Organizing Committee and Korean Broadcasters Association. A total of 201 drama series from 45 countries were submitted this year, and 24 awards were given to actors, actresses, and short, medium-length, and full-length drama series. On August 30th, JYJ‘s Yoochun received the ‘Outstanding Hallyu Drama Male Actor Award’ at KBS‘s ‘2012 Seoul Drama Awards‘ for his performance on SBS drama ’Rooftop Prince‘. Yoochun saddened viewers when he stated with a hint of tears in his eyes, “I am glad to have received an award for such a great drama. I want to dedicate his award to my father, who was not able to watch“. Yoochun’s father unfortunately passed away this past March. 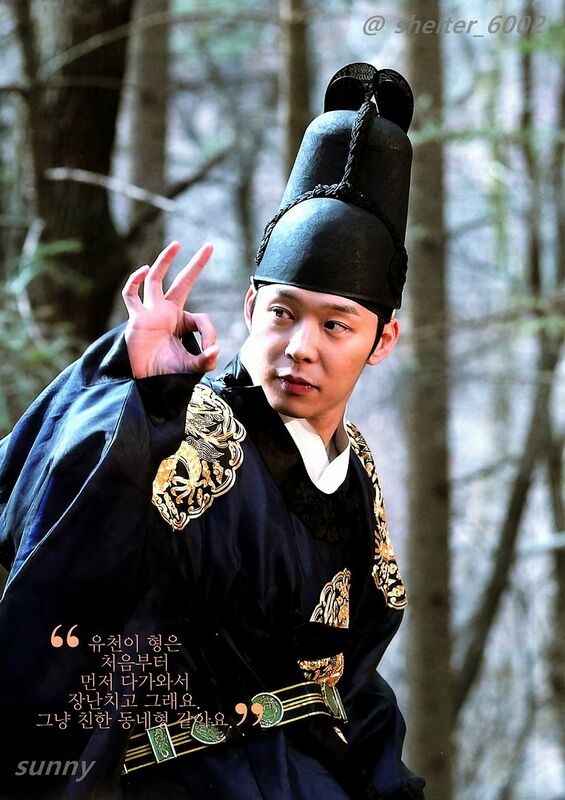 Yoochun participated in filming ‘Rooftop Prince’ after the funeral service. In addition to the ‘Outstanding Hallyu Drama Male Actor Award’, Yoochun also received the ‘Netizen Popularity Award’.